Cryogenic deburring and deflashing systems are versatile by design to meet the wide ranging demands of machined and molded parts. As parts vary in physical properties and geometry, a unique set of processing parameters is required for each part. All new parts submitted for Nitrofreeze Deburring or Deflashing undergo a process development phase known as our Pre-Production Engineering Evaluation (PPEE) Program. Below we will flesh out some cryogenic deburring & deflashing concepts with the assumption you have a basic understanding of the process. For a brief summary of the process, visit our cryogenic deburring page. Time refers to the duration of time which the parts are tumbled and blasted at temperature. 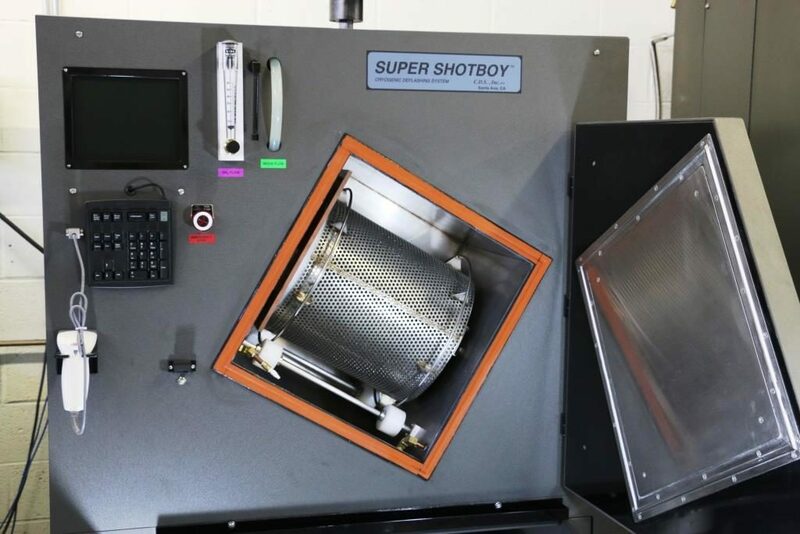 Though we may refer to this as cycle time, this does not include time spent staging batches, cooling the chamber, or loading and unloading the basket. Cycle times can range from a few minutes to as high as thirty minutes. Batch volume as well as the accessibility of the burr or flash tends to have the greatest impact on cycle time. Crowded batches and hard to reach burrs often run longer cycle times. Temperature refers to the atmospheric temperature of the processing chamber. When we talk about temperature we are discussing to what temperature we want to cool the chamber. Liquid nitrogen is flashed into the chamber as gaseous nitrogen, cooling the chamber to the pre-programmed temperature. The function of the cooling is to embrittle the undesirable flash or burrs. Once rigid, this material can be knocked off by the tumbling and blasting action of the process. Often cooling is performed to the glass transition temperature of the material. 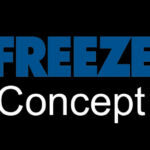 However, Nitrofreeze may run parts as cold as -200 degrees Fahrenheit. Manufacturers often inquire about the impact these temperatures have on the physical and mechanical properties of the part. Other than the removal of the delicate unwanted material, we have had no reports of any changes to parts’ properties following processing. Nevertheless, we encourage customers to speak to their material suppliers who can speak more to the process and its effectiveness. Type of Media refers to the dimensions of the media used. “Size of Media” would be a more accurate descriptor for this variable but that would ruin our easy to remember “5 T’s” memory device! The Type of media often plays the largest role in determining processing aggression. All blast media used in Cryogenic Deburring and Deflashing is a cylindrical, cryogenic-grade polycarbonate. When we discuss Type of Media, we are referring to the varying length and diameters of the cylindrical beads. Polycarbonate (PC) is a non-abrasive. This allows Nitrofreeze to process parts without impacting critical surface tolerances. Even a non-abrasive however can cause damage at large enough size and velocity so choosing the proper media is critical to protect the parts. Dialing in a proper media size is done in sampling to ensure parts are consistently protected. For cleaning internal dimensions, the media must be small enough to access the area of concern. For holes smaller than 0.020, we recommend Nitrofreeze Dry Ice Deflashing & Deburring. Tumble Speed, measured in rotations per minute (RPMs), determines the speed at which the parts basket tumbles inside the chamber. A slow tumble may be used simply to flip the parts and expose each part’s surface to the media blasting. Alternatively, a fast tumble may be employed to create more aggressive part-on-part action, assisting in the removal of external flash and burrs. The part’s material, robustness, and burr location determines the tumble speed used. Throw Wheel Speed, also measured in RPMs, refers to the rate of the throw wheel rotations and the velocity at which media is broadcast at the parts. The systems used in Nitrofreeze Deburring & Deflashing employ throw wheels speeds up to 20,000 RPMs. And that’s it! These five variables are the core of any cryogenic deburring processing procedure. A process development phase is performed upon the receipt of each new part number and these process parameters are held proprietary by the Cryogenic Institute of New England, Inc. However, for manufacturers who wish to bring this equipment in-house, these values can be provided as part of our Nitrofreeze Technology Transfer Program following equipment purchase. This entry was posted in cryogenic deburring, cryogenic deflashing, Deburring, Deflashing, Uncategorized and tagged cryogenic deburring, cryogenic deflashing on May 8, 2018 by Jordan Anderson.